Approximately 2 inches tall. It's tough for a cat to be purr-fect every day, but in your eyes they're angels anyway. 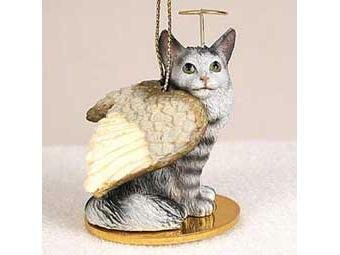 Whether praising the furry friend you have now, or remembering an angel from the past, these divine feline Tiny Angel Ornaments are the popular choice. The gold string makes it the perfect accent to a Christmas tree. Simply remove the string if you want to display your beloved pet on a shelf or mantle. All Angels are individually boxed. Buy this item and earn 13 points valued at $0.65.